February for us here in the West means that it's time for the Chinese Lunar New Year over in, well... China. It's quite a big celebration, with fireworks and red packets and all sorts of stuff. In honor of the New Year, Skirmisher Publishing has released a new monster for 5th Edition. It's the Earth Dog. In honor of the 2018 lunar Chinese New Year, Skirmisher Publishing is proud to announce the release of “Earth Dog: A Monster for 5th Edition”! Earth Dogs are elemental animals look like sturdy, well-formed, hairless mastiffs that vary in color from beige or brown to orange or even yellow. They are gregarious, loyal, and exuberant and respond well to life with various intelligent species, and are therefore often kept as pets, animal companions, or guards by Earth-dwelling beings like Dao. 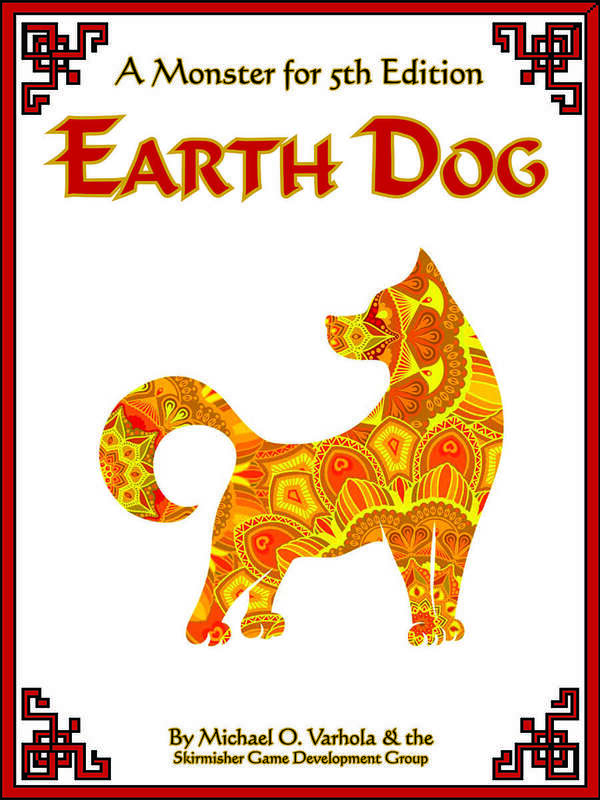 On the Prime Material Plane, Earth Dogs are most likely to be found in places like mountains, rocky ravines, gemstone mines, and the temples of deities with which such places are affiliated, where they typically serve as guardians. In cultures that observe the Lunar New Year and adhere to the Asian Zodiac, spellcasters often summon Earth Dogs to take part in annual celebrations. Happy Chinese New Year! We very much hope you enjoy the Earth Dog.